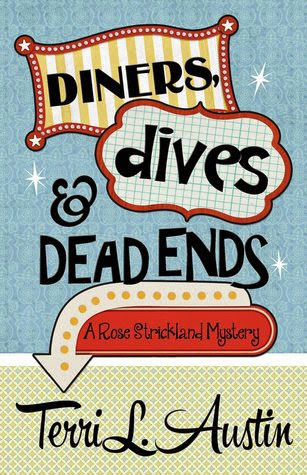 I read a really good book recently, y'all — Diners, Dives & Dead Ends by Terri L. Austin, Book 1 in the Rose Strickland Mystery series. Let me tell you a little about it. Diners, Dives & Dead Ends is such a fun read! It is filled with wonderful characters such as Axton Graystone (Ax for short, whom Rose has known since first grade), Roxy Block (her anime-loving bestie), Ma Ferguson (her septuagenarian boss of Ma's Diner), Ray (the boss's son who, according to Ma, never does anything right), and Sullivan (more about him later). My favorite character is Rose, because of her loyalty to friends, her strength of character, her "wicked sense of humor and independent spirit." Rose (short for Rosalyn), along with her older sister Jacqueline (both named for First Ladies — Rose calls her "Jacks"), was raised in the lap of luxury in Huntingford, Missouri. Growing up, Rose got everything she ever wanted — as long as what she wanted coincided with what her parents wanted for her. ...the college they had chosen for me. A small, private, all-girls-all-the-time school. I hated it. that Rose's hopes and dreams collided with her parents' plans for her. Rose refused to return to the women's college, wanting to attend a different college instead, one where she would be happier. Her parents responded to this decision (an unreasonable one, in their opinion) by kicking her out and cutting off all financial support. No doubt, her parents expected Rose to come to her senses, apologize, grovel even, re-enroll at the girls' school, and carry on in their pre-determined plan for her life. No doubt, they are astonished that, after five years, Rose is still supporting herself and able to pay for college. For the details, read the book! Oh, and there are also mysteries. Can't forget them! Rose is quite a sleuth, although a reluctant one, and saves the day by rescuing Ax. (No, that's not a spoiler. This is a cozy mystery. The heroine's best bud doesn't get killed in a cozy.) She keeps asking the police for their help, but they basically ignore her missing person reports, so she has to find him without them. Diners, Dives & Dead Ends has a great ending! Author Terri L. Austin picks up a minor plot thread from the beginning of the book, and re-weaves what seems to be the ending of the book into a not-quite-cozy, exciting, thrilling direction — one which ensures that Sullivan will be back in Rose's life for many books to come! ● His blue-black hair was combed away from his perfect face. His gold eyes — not golden-brown, just gold — glittered in the faint glow of my yard sale flamingo lamp. With light honeyed skin stretched over strong cheekbones, he was beautiful — like fallen angel beautiful. He scared me a lot more than the other guy. It was obvious he was in charge and Scarface was just there for back up. ● Putting his hands up in a placating gesture, he stepped into the apartment. He was dressed in an expensive suit with a red striped tie. "I'm not crazy about that tie." He looked down and fingered it. "Why not?" "Did I say that out loud"? God, I was tired. "Yes, you did." He walked toward the kitchen. "Got anything to drink?" I trailed after him. "Not for you." ●I tried to pull my hands out of his grasp, but he tightened his hold on me. A little shiver zinged through me. Sullivan was the bad guy. Not the guy I should be zinging for. ●He leaned forward, his hands bracing on the armrests of my chair. He was all up in my personal space. And he smelled so good. This is just the tip of the iceberg. For more about Sullivan (or BJ [Bossy Jackass] as Rose refers to him, before she sleuths out his name), Ax, Roxy, Ma, and of course Rose, read Diners, Dives & Dead Ends by Terri L. Austin. It's a Five-Kitty read, and highly recommended for all cozy mystery fans, especially those who like their heroines strong and sassy, and their men on the bad side.